Glasgow is an enchanting Scottish city that has a vibrant, multi-cultural heart and a really creative vibe. Winding streets give way to modern shopping centres, surrounded by historic buildings and beautiful parks and open spaces. The Scots are serious about their breakfast and finding somewhere to enjoy a hearty start to the day in Glasgow is easy. 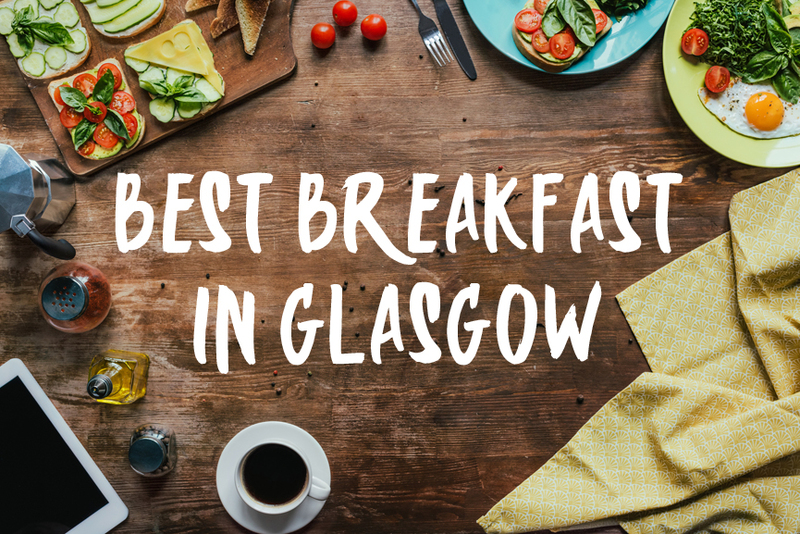 Famous for offering filling, well cooked food served by possibly the friendliest staff in Glasgow, the Wilson Street Pantry is a hidden gem of a place. Cosy decor and a simple, but well executed menu mean you may have to wait for a table. When you see the Eggs Royale, sourdough toast, sausage breakfast rolls, bacon breakfast rolls or scrambled eggs with black pudding go past you will see why this place is so popular. Great value good food served with a smile at this traditional Scottish cafe. Martha’s brings healthy and hearty fast food to the busy people of Glasgow, serving up made from scratch dishes for diners to eat in or on the go. Open during the week to service city centre commuters, Martha’s has a simple ethos that allow diners to make healthy choices without losing out on flavour or quality. Diners can enjoy hearty egg pots with salmon or sweet potato, greek yoghurt and wholemeal porridge or fill up on a hot rolls stuffed with Scotch pork or beef or even veggie haggis. Cute as a button, with mismatched china and the smell of home baking, The Hidden Lane Tearoom is a delicious little find in the heart of the West End. Best known for it’s endless afternoon teas and homemade cakes and fancies, this little tea room also offers a pretty decent breakfast for later risers. Open from 10.00am, diners can enjoy Belgian waffles, mini pastries, pancakes, scrambled eggs and avocados or even tuck in to a Morning Tea for two complete with baked egg muffins, mini scones and brioches and pots of steaming hot tea. Tucked away off the beaten track in the Garnethill area of the city, Singl-end is a fabulous eatery offering big portions of great tasting food. Using fresh local produce to create an innovative menu, breakfasts here are full of flavour and very filling. Customers love the casserole style “Baked Meaty Eggs”, halloumi with avocado smash, haggis with sautéed chestnut mushrooms and home-baked beans or opt for healthier options with organic porridge and almond milk or home baked granola. An awesome traditional Scottish cafe with tons of character, the Kelvingrove Café is an homage to the style and design of the 19th Century with cosy snugs and walls full of contemporary works of art. The food is almost as good as the decor, and the staff are friendly and hospitable. Breakfasts are big and will definitely set you up to a walk around the city. Choose from bacon and black pudding hash, bean quesadilla’s or salty porridge amongst a host of other delicious brekkie options. A friendly and food conscious chain restaurant, Bill’s somehow manages to retain the feel of an independent eatery. Breakfasts are hearty and filling and served up in comfortable surroundings in the heart of the city. Diners can choose from Bills Breakfast with Cumberland sausages, streaky bacon and pesto roasted plum tomatoes, smashed avocado on toast, blueberry buttermilk pancakes or eggs Benedict amongst other yummy dishes, complimented by steaming hot coffee or a selection of breakfast teas. Stripped back decor and old school tables give a retro feel to this popular and alway busy eatery in the city. Cafe Strange Brew has a reputation for serving up steaming hot coffee and fabulous food, meaning that whatever time you arrive you can probably expect to queue. Service is fast and efficient and innovative dishes like the Stornaway Stack with black pudding, poached eggs and bacon crumb or the duck egg chorizo hash continue to pull in hungry punters from all across Glasgow. A little weekday breakfast gem hidden in the heart of the financial district, Where The Monkey Sleeps serves up hearty Scottish breakfasts for commuters and visitors alike. Using the very best fresh local produce, meats and teas and coffee beans, The Monkey Sleeps supports Scottish farmers and believes in keeping things local. If you are passing, pop in and enjoy hot bacon or sausage filled rolls, haggis bagels, freshly made french Toast, fruit and porridge or eggs Benedict all served up in funky, friendly surroundings. Tucked away in to the heart of Glasgow’s city centre in West George Street, Cafe Wander offers a quiet respite from the busy city streets. Big breakfast plates and hot coffee and tea are on offer here, as well as a warm welcome and a friendly atmosphere. Some of the breakfast favourites include French toast with bacon and maple syrup, Lorne sausage rolls, Ramsay of Carluke Steak sandwiches and sweet waffles with Nutella and whipped cream! A friendly, laid back, independent coffee spot in the Merchant City area of the city, Spitfire Espresso serves up freshly ground beans and excellent all day breakfasts, all served with a smile and a rockabilly soundtrack. Chow down on poached eggs and smoked salmon on a toasted bagel, eggs and black pudding with traditional Scottish Lorne sausage or vegan Spitfire baked beans. They also serve up a variety of flavoured coffees and a selection of breakfast teas, as well as homemade cakes and other goodies.